on flickr as well. Links are in the sidebar at right for your convenience. being up until 1:00 AM is hard on the driver. We left the swelter of Needles and began our trek across the Mojave Desert. We meandered through the many small desert towns of the Mojave, and enjoyed the distant mesas. After Amboy, our engine overheated and we had to wait for it to cool down. In the mean time, I added a contribution to the "public art" corridor. People have long added their names to the desert by using stones and sticks, so I wrote my initials with some rocks. Soon, we were back on the road. We took it quite slow on the rough road to Ludlow, where we filled up the tank and purchased coolant for the engine. The road carried us on through the desert into Barstow. Our motel of choice was the Route 66 Motel. We took the Mustang to a service station where we realized the radiator reservoir had a leak. After running a few errands and having dinner, we got ready to go to a drive-in movie. The double feature was "Salt" and "Inception", both great movies. 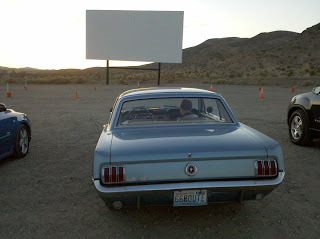 It was a wonderful experience to be at a drive-in theater. Taking teens to a drive in is an important history lesson and the best way to consume popcorn! Near your home I know of two drive ins still in operation. One is in Shelton on 101 North (another famous hiway) It used to be a blue movie place when I was a teen, but now it's general fare. I take my son at least once a summer--we have a family recreational lot near there. The second is just East of Shelton half an hour or so, but still West of Bremerton. Never been to that one, just noticed it driving by the day after watching a movie at the Shelton drive in about a year ago. Glad to know there are other drive ins around here and there--though rare! Text and images © 2010 Seth! & Adrian Leary. Simple theme. Theme images by konradlew. Powered by Blogger.